by: Simon James Goring. Prepared as part of the Delta Program Research Mentor Training Seminar. I discuss the statement further here. Mentoring success does not rely on the success of a project, or set of projects. If the goals of the mentee and mentor are laid out early and reviewed over time, success metrics may vary but are likely to be achievable. If there is good communication, and both partners in the mentoring exercise are cognizant of the goals, there has already been success in the relationship. While success metrics may vary across mentoring relationships (e.g., skills learned, papers published, grades achieved), communication is often the key to achieving mentoring goals. Figure 1: A mentor is a source of knowledge, but must also act as a role model. 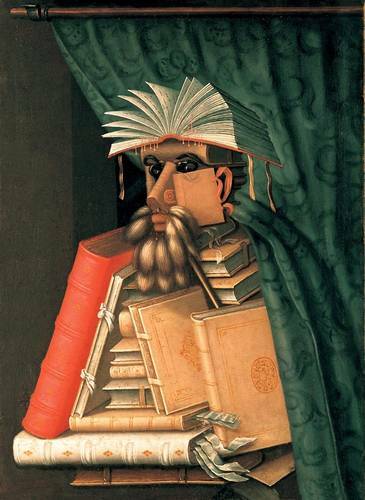 Wolfgang Laz (pictured in this painting by Guiseppe Arcimbolo) had a reputation for obtaining his library by whatever means necessary, and that reputation lives on. A mentor’s reputation lives on through their mentees, so a mentor must consider how their actions may be interpreted. I have benefitted greatly from mentoring at the undergraduate and graduate levels, as well as in my personal life. My best mentors have been both advisors and role models. A mentee should be treated with respect, regardless of differences in academic or institutional hierarchies, or personal background, but, the mentor must be cognizant of these differences. A mentor is there to act as a guide and to role model the behaviour they expect from their peers. My positive experiences with mentoring relationships have all reflected this balance, and I hope to achieve this balance as a mentor. To ensure success I would identify and emphasize core theoretical principles of the research early. Highlighting core principles will allow the mentee to better assimilate and retain knowledge, and to understand the application of the research. Once core principles are established, subsequent knowledge can be presented and supplemented on an ad hoc basis. My relationship to scientific research is driven by an intense curiosity and understanding of core biological principles helps drive that curiosity, and helps focus questions that arise from that curiosity. Providing an opportunity to develop and answer questions is imperative within a research-oriented mentoring experience. I hope to train critical thinkers, so whether the mentee finds success in answering the question is not always as important as developing the skills to ask good questions. There are many simple questions that have easy answers, while others have often turned out to have very complicated answers, for example, a fundamental biogeographic question is “Why do organisms live where they do?” (Fierer, 2008). Learning to differentiate between the two and to parse complicated questions into manageable components is key to ongoing research success. To motivate mentees to success I would make an effort to provide them with ongoing opportunities to evaluate their performance and comprehension. Providing the mentee with opportunities for self-evaluation can generate greater interest in the research and allow them to become aware of deficiencies in their core knowledge. Understanding my limits as a researcher has been a valuable (if hard learned) skill. Mentees or students who are aware of their capabilities will perform better when presented with major evaluation opportunities such as presentations and will be more strongly motivated improve their understanding when they recognize deficiencies. This component also applies to me as the mentor. Mentoring is a learning experience, and as such requires constant feedback. Learning self-evaluation techniques is a skill that allows continuous development, especially when the activity, like mentoring, has constantly changing goals and as such requires constant assessment. Providing mentees with opportunities to demonstrate their aptitude in a safe environment, such as lab-group presentations, is worthwhile. In addition, weekly check-ins, report writing and opportunities for external evaluation through conference presentations, journal submissions and other activities would be central to a mentoring relationship. The choices would be governed by the career stage and intentions of the mentee. Recognizing that modern science requires collaboration, I would encourage the development of cooperative learning skills and the development of a research network. Cooperative learning would be encouraged through structured class assignments, lab research (when applicable), and online forums for class discussion. The extent of effort placed into this component would depend on the structure of research experience. Collaboration has been a key component of my own development as a researcher. The collaborations I developed, both within my research group and from meetings at conferences, have been invaluable. I will encourage mentees to reach out to experts and will assist them in making contacts within the field through introductions. In addition, with an emphasis on the first two points discussed, collaboration should come easier to a mentee, as they can be assured that they understand their fundamentals and have the capacity to answer the questions that they find interesting. Fierer N. 2008. Microbial biogeography: patterns in microbial diversity across space and time. In: Accessing Uncultivated Microorganisms: from the Environment to Organisms and Genomes and Back. K. Zengler (editor). ASM Press, Washington DC. pgs. 95-115.